Please consult sizechart above to determine your size. On the left the sizelabel from Collectif, the other columns represent our sizing indication plus body measurements. Bust is rather narrow and doesn't hardly stretch (linen). Make sure you are ordering where your bust measurement falls. New collection! 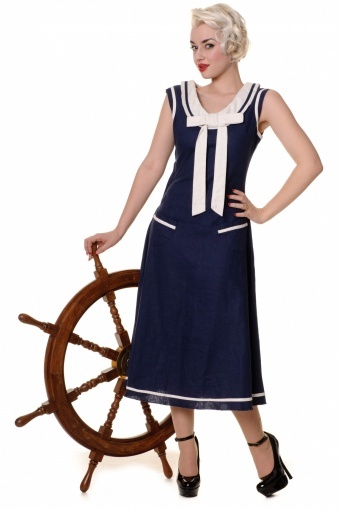 The Fedora Nautical Linen A line dress in navy from Collectif is a 1920s nautical inspired style. 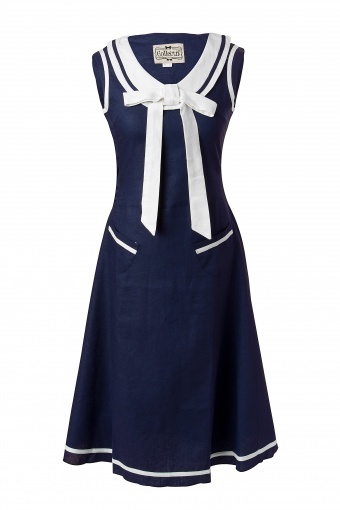 Perfect for spring/ summer we have made this style in a beautiful linen fabric with contrast trims and bow. This is a flared style which finishes mid calf and is finished off with little pockets. Side zipper. The label indicates cotton/spandex, but this is faulty, it's 100% linen.